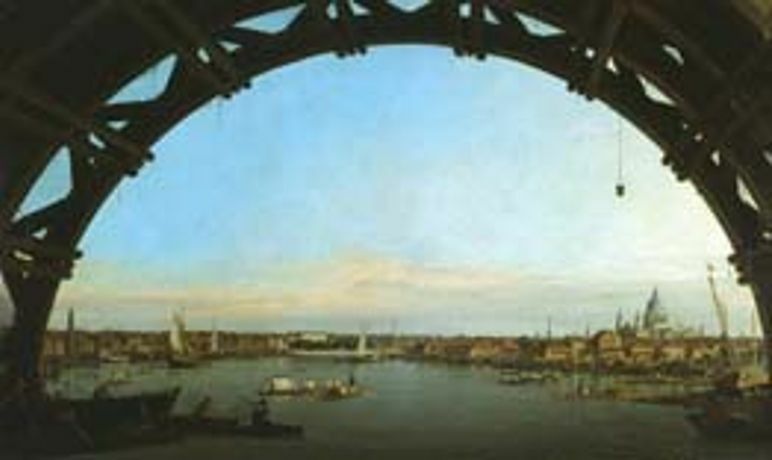 In 1746, Canaletto visited England, beginning a nine-year stay that would completely re-launch his artistic career. This major exhibition brings together the paintings executed by Canaletto during this intriguing period. Canaletto left a perfect city ' Venice ' and came to a magnificent mess. London fascinated him. His views of England are often panoramic but precise to the last brick and flag-stone. At the same time each scene is saturated in a distinct quality of light ' we feel the season, the time of the day, the cut and patina of the buildings, the imperfect reflections in the rivers, and huge parks and skies. In London the Thames seemed to him to be a huge commercial version of the Grand Canal, flanked by warehouses; beyond its boundaries the river became more idyllic. He painted suburban villas of the aristocracy and medieval castles. This exhibition will be a comprehensive treatment of this extraordinary episode. As well as including an outstanding selection of Canaletto's views of London and country homes and castles, the exhibition will show Italian views and capricci which he painted in England, including views of Venice and decorative schemes done for palatial London houses. English Grand Tourists (as they were called) had poured into Italy and bought up the pick of Canaletto's world-famous views of Venice. In this way the exhibition will provide a complete account of Canaletto's activity in England. Many of the loans come from English private collections, which are not open to the public. The exhibition catalogue is written by Charles Beddington, the Exhibition Curator. The exhibition is co-orgniased with the Yale Center for British Art, New Haven, USA where it was show between 19th October - 31st December 2006. The show has been made possible by the American Friends of Dulwich Picture Gallery through the generosity of the Arthur and Holly Magill Foundation, the Edith Callam Memorial Trust, the Elizabeth Cayzer Charitable Trust, the Italian Cultural Institute and The Friends of Dulwich Picture Gallery.